In Patch 3.2, World of Warcraft's engineers were given the opportunity to craft Jeeves, the perfect gentleman robot butler. Jeeves not only allows serves as a repair bot for you and your party for 10 minutes every hour, but also grants you access to your personal bank even from the depths of Ulduar. Jeeves is an awesome addition to the engineer's arsenal and can really save you some repair bot material money in the long run. Below is my comprehensive guide to crafting Jeeves, enjoy! The first step on your journey to Jeeves will take you to the Inventor's Library in Northern Storm Peaks, just across the chasm from Ulduar. Be sure to grab or craft 4 x Handfuls of Cobalt Bolts and 5 x Overcharged Capacitors before heading out as your will need them shortly. At the Inventor's Library, you will find mecha-gnomes on mechanostriders called Library Guardians. Start mowing them down (being sure to scrap them for parts as you go) and eventually you will stumble across the SCRAP-E Access Card. This item will open up a quest where you will need to bring your Handfuls of Cobalt Bolts and Overcharged Capacitors to SCRAP-E inside the Library. After you complete the simple turn-in quest, SCRAP-E will open up a nearby console allowing you to learn how to make 5 x Scrapbot Construction Kits out of 10 x Saronite Bars. Since you are already at the Inventor's Library, it is time to start farming for Schematic: Jeeves. The schematic can be found by harvesting many different higher level mechanical units in Northrend for parts (engineer skinning them). Fortunately for you, the schematic seems to have a much higher drop rate off of the harvested corpses of Library Guardians. It took me about an hour of obliterating these little guys before coming across the schematic and that appears to be a fairly average time. Depending on your luck, finding Schematic: Jeeves could take significantly longer or shorter for you. Regardless, stick with it as I assure that your chances of finding it could not be greater. Once you have learned how to make Jeeves (or before if you want to have the mats in hand once the schematic drops) it is time to start gathering materials. The first material you will want to turn your attention to is the 8 x Titansteel Bars. This is because they are potentially your butler's most costly components and, if you are a miner who wants to make them yourself, they will take you some time to procure. Obviously, if you are not a miner, you will simply need to purchase these bars off of the Auction House. Alternatively, you could buy the components for Smelt Titansteel and pay friendly miners for use of their 20 hour cool downs. Needless to say, go with whatever option is cheaper on your particular server. If you are a miner and want to make the 8 x Titansteel Bars yourself, you will need a total of 24 x Titanium Bars, 8 x Eternal Earth, 8 x Eternal Fire, and 8 x Eternal Shadow. You can find the Titanium Ore needed to make your bars in rare spawn Titanium veins which occasionally take the place of Saronite veins. Patrol Icecrown for your best chance of finding them. The Crystalized Earth, Fire, and Shadow you can mine from these veins will likely go a long way towards meeting your Eternal needs as well. Keep in mind if you try to make them yourself that you can only make one bar every 20 hours so you will want to start the process of gathering the bars as soon as possible. Jeeves requires several different repair bots to become operational starting with 2 x Field Repair Bot 74A, Warcraft's original repair bot. Obviously, rather than constructing them yourself, you could simply buy them from another engineer, but where is the fun in that? This schematic for Field Repair Bot 74A can be found on the ground in Blackrock Depths on the floor in Golem Lord Argelmach's chambers. BRD makes for an exceptionally easy solo at endgame, so landing the schematic involves only a minimal time investment. To craft the 2 x Field Repair Bot 74A you will need a total of 32 x Thorium Bars and 4 x Fused Wiring. Eastern Plague Lands is a decent place to turn up Thorium veins and you can craft a stack of 5 Fused Wiring with 2 x Essence of Fire and 3 x Delicate Copper Wire using the Schematic: Fused Wiring sold by Viggz Shinesparkled in Shattrath. The Delicate Copper Wire can be made by low level Jewelcrafters for 2 x Copper Bar each. Head to the Blazing Elementals in Un'Goro Crater for the Essence of Fire if you choose not to buy it. You may also find some Thorium veins along the way. To learn to make the 10 x Field Repair Bot 110G you will need, first you will have to find the Schematic:Field Repair Bot 110G. Retrieving these papers will involve a trip to Outland as they drop off of the Gan'arg Analyzers in western Blade's Edge Mountains. Thankfully the drop rate on the schematic is rather high, so your actual grind will likely be nearly as quick as your travel time. Actually crafting these Bots requires a great deal of Outlands materials, making them a prime target for purchasing if they are available. If you choose to make them yourself, however, you will need a total of 16 x Adamantite Bars, 16 x Handful of Fel Iron Bolts (1 x Fel Iron Bar each), and 2 x Khorium Power Core (3 x Khorium Bar and 1 x Primal Fire each). At this point, you have already learned how to make Scrapbot Construction Kits through the SCRAP-E quest explained above. To make the 20 you need will require nothing more than 40 Saronite Bars. It really is that easy! There are four ways to get the 2 x King's Amber needed for Jeeves. First and easiest, you can simply buy them on the Auction House. Second, if you are a Jewelcrafter or know a generous one, you would have a chance to find one when prospecting Titanium Ore. Third, you could get Alchemists to transmute 2 x Autumn's Glow and 2 x Eternal Life into 2 x King's Amber, presuming you can find someone who knows how. Lastly, you can buy King's Amber at 20 Emblems of Heroism a pop from your faction's badge quartermaster. Odds are, if you have raised your engineering enough to craft Jeeves, coming up with the 30 x Handful of Cobalt Bolts needed to complete your project should not be a problem. In fact, you likely came across many of them while farming for the schematic. Just in case, you can craft the Bolts at a rate of 1 to 3 per 2 x Cobalt Bars. Congratulations! At this point you have finally finished construction of your perfect gentleman robot butler. Use him often to repair your gear and that of your allies, to sell vendor items when your bags are full, or to access your bank from anywhere. For a particularly fun time, set up Jeeves and MOLL-E right next to an Auctioneer and enjoy 10 minutes of your own personal business center. One of the most exciting features planned for the upcoming World of Warcraft expansion, Cataclysm, is the facelift Blizzard will be giving to Azeroth. The video below will give you a nice taste of what to expect once Deathwing's rage is unleashed. Blizzard has put up a new website dedicated to sharing information about World of Warcraft's third expansion: Cataclysm. Follow this link to check out the World of Warcraft: Cataclysm Official Site. Of particular interest on the site are the many screen-shots, the Gilneas and Lost Isles walk-throughs, as well as the Faces of Cataclysm feature which sets the path for the expansion's storyline. Enjoy! Sounds like Cataclysm is shaping up to be very different from Wrath of the Lich King or Burning Crusade. Here is the trailer for World of Warcraft Cataclysm. Enjoy. Just moments ago during the Opening Ceremonies of Blizzcon 2009, the next World of Warcraft expansion, Cataclysm, was revealed. The expansion will feature new race/class combinations as well as a revamp of classic zones and content including everything from the Barrens to Shadowfang Keep. Two new races will also enter the fray: the Worgen for the Alliance and the Goblins for the Horde. Other interesting features for the next expansion will include a Guild leveling system, ranked battle grounds, and a new secondary profession called archeology. Get ready to battle Deathwing as you push to the new 85 level cap when this expansion drops late 2010 or early 2011. A rare or exotic mount is always a sure way to turn heads. Sure, you could grind reputation, complete lots of achievements, or shell out tons of cash to impress your friends and random passersby, but why not just try to get lucky instead. Below is a brief rundown of the World of Warcraft mounts available as drops and where you can hope to find them. Baron Rivendare in Startholme drops this long sought after mount. The facts that the instance can easily be completed solo and the drop rate for the Reins was increased to 1% in patch 3.o.2(up from a 1 in 5,000 chance) make it one of the easiest drop mounts to come by. Not surprisingly, this exceptionally rare mount drops off the Time-Lost Proto-Drake, a rare spawn who patrols around Storm Peaks. The good news: the Reins have a 100% drop chance. The bad news: this mob only spawns once every 3 to 24 hours, disappears after having flown one of his many possible routes, and shares a spawn with other less alluring mobs. This mount will likely require a long and tedious hunt, but a mob tracking add on like NPCScan will really help your chances. You have an exceptionally small chance of turning up this blue beauty whenever you fish in Northrend fishing pools. It is not a drop per se, but close enough to warrant mention here. If you fish a lot and own a lucky rabbits foot, you may find yourself atop this rare mount. Kael'thas Sunstrider in Heroic Magisters' Terrace drops this riding chicken. Though he may be a much easier foe here than in the Eye, you will still not be able to bring him down alone. Bring a friend and hope that this rare drop falls into your lap sooner rather than later. One of the coolest ground mounts available, these Reins drop off of Anzu in Heroic Sethekk Halls. Anzu can only be summoned by a Druid who has completed the epic flight form quest line so buddy up with your friendly neighborhood shape-shifter if you hope to bag this gem. If you are a Druid, Anzu is soloable at endgame, but you better be Feral and your margin of error is as small as this mount's drop chance. With approximately a 1% drop rate, odds are you will kill Zul'Gurub's Broodlord Mandokir many times before having a chance to own his beloved mount. Thankfully this entertaining encounter presents little challenge to a small group of endgame players. This armored cat is the second mount available in Zul'Gurub and drops off of High Priest Thekal. A relatively small group of endgame players should be able to handle this shape-shifter with minimal difficulty, but with less than a 1% drop rate it will take a great deal of finger crossing to take this tiger home. Skadi the Ruthless in Utgarde Pinnacle drops this beauty less than 2% of the time when you down him in Heroic mode. Since you will be running Heroics to get some of the new 3.2 badge gear anyway, may as well make Skadi's home on of your primary targets. This mount can be found on the Infinite Corrupter in Heroic Culling of Stratholme and has a delightful 100% drop chance. To make things a little more challenging, the Corrupter is at the end of the instance and despawns 25 minutes after the violence begins. It will take a well geared, organized group and lots of chain pulling to land this Drake, but these days that combo is not too hard to come by. To mount this fanged horse, you will need to down Attumen the Huntsman in Karazhan. The drop rate is not good, the instance has a lockout timer, and this old boy is far from soloable so count your lucky stars if you nab these vintage reins. These mounts drop off Sartharion in the 10 and 25 man versions of the Obsidian Sanctum when the boss is defeated with all three Drakes still alive and well. The drop rate is 100%, but Sartharion 3d is not for the feint of heart. Cozy up with the top raiding guild on your server if you hope to take one of Sartharion's brood as a mount. These mounts are exceptionally rare drops which can be found at the end of the Eye of Eternity (10 and 25 man versions respectively). You will need a solid group, someone with the right Key to the Focusing Iris, and a lot of luck to come across this rare mount. This mount has a small chance to drop off any of the bosses in 25 man Vault of Archvon. The only way to maximize your chances on this one is to run the raid every week with an honest Master Looter. This Mammoth will truly put your luck to the test. If you want to fly across Northrend on top of a Pheonix, you will need to pull these ashes out of Kael'thas Sunstriders cold, dead hands. The mount has a very small drop chance and the instance is still moderately challenging even by today's standards. You may very well never see one of these mounts wandering your server, let alone own one. Good luck getting your hands on this one as only a successful completion of Yogg-Saron's 25 man hard mode will give you a shot at this flying monstrosity. If you can handle Ulduar's Old God without the assistance of any Watchers, you will have a guaranteed one in twenty-five shot at this bizarre flying machine. The World of Warcraft community is on fire following the release of some "leaked" information regarding the next expansion. According to a post on MMO Champion, the next expansion will be titled Cataclysm and will center around a catastrophic event which will dramatically alter Azeroth's geography. Along with two new races (Goblins and Worgen) and a level 85 cap, the expansion will supposedly largely involve a retooling of old world content for endgame. Check out the full article here, though be warned that if it is accurate it contains some serious spoilers. Keep in mind that his sort of Pre-Blizzcon speculation is common and often wrong. 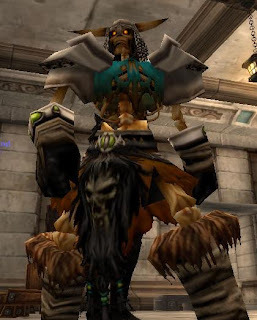 Hopefully everyone remembers that the Southshore Worgen were practically confirmed as an Alliance race by many bloggers prior to the release of Burning Crusade. Whoops...Draenie! On the other hand, MMO Champion is far from a fly-by-night operation. Also, there is some loose evidence in the game already that may lend credence to the "leaks." For more speculative goodness, check out MMO Champion's response to the initial backlash as well as some semi-interesting forum posts on the topic here, here, and here. Again, be mindful that many of these discussions are riddled with potential spoilers. Here's looking forward to the curtain being lifted at Blizzcon this weekend. Blizzard has announced that as part of the celebration of the fifth anniversary of World of Warcraft, the Onyxia encounter will be re-released as a level 80 raid instance. The encounter should be available on the Public Test Realms relatively soon and will ultimately drop as one of many "big plans" to be revealed in content Patch 3.2.2. Check out the official announcement here. According to information released thus far, the encounter will come in both 10 and 25 man flavors. Though the loot tables will be reworked for level 80 itemization, Blizzard plans to recycle many of the textures from the encounter's classic drops. The Black Dragonflight Brood Mother will also now have a chance of dropping a 310% speed Onyxia Broodling flying mount. Even if you choose not to tackle the new raid, players who log on during the month of November will find an Onyxia Brood Whelpling in their mailboxes as a gift similar to the Baby Blizzard Bear from World of Warcraft's 4th Anniversary. Though it will be sad to see the classic 40 man Onyxia permanently depart, I am excited about the opportunity to head back to the Wyrmbog for some reworked old school fun. I am also curious whether or not the attunement quests will be back as well. At the very least, here's hoping for a new and improved Ancient Cornerstone Grimgoire. I would love the chance to bring my Summoned Skeleton out of retirement. There are a ton of great fake Warcraft Movie trailers floating around these days and this is one of them. Reaching beyond Warcraft cinema scenes to other videos, this compilation is more fleshed out than most. Major kudos to its creator Bloodrunsclear and here's hoping you enjoy it as much as I did. With the advent of patch 3.2 comes the arrival of a new mount for Horde players: the Venomhide Ravasaur. Check out the picture below. To get your hands on this beauty, you will need to do some new quests in Un'Goro Crater for Mor'vek the Ravasaur Trainer who is near the base of the ramp from Tanaris into the Crater. The first of which, Toxic Tolerance, simply involves getting poisoned by Venomhide Ravasaurs multiple times (beware the misleading quest text). Next, Mor'vek will send you off to collect some Venomhide Ravasaur Eggs for the quest Venomhide Eggs. After those relatively simple quests, Mor'vek will give you the quest for the mount itself: They Grow Up So Fast. To complete the quest you will need to turn in 20 x Runecloth, 20 x Rugged Leather, 80 gold, and 20 x Venomhide Baby Teeth. To get a Venomhide Baby Tooth, you will need to complete one of four random daily quests with your freshly aquired Venomhide Hatchling. The quests will send you either to fight Searing Rocs in Southwestern Tanaris, to get meat from the Silithid of Southern Un'Goro's Slithering Scar, to find Silithid Eggs in the Noxious Lair in Tanaris, or to get dinosaur meet of the various dinos of Un'Goro. Rinse and repeat the dailies for twenty days and turn in the required materials to Mor'vek to recieve your Whistle of the Venomhide Ravasaur. Happy riding and don't forget to buckle up. For those of you who are unaware, with the advent of World of Warcraft patch 3.2, the Black Knight makes his return to the tournament grounds as the final boss of the Trial of the Champion instance. The fight against this servant of the Lich King takes place in three stages each with their own nuances. In the transition from Normal mode to Heroic, the Black Knight simply does increased damage. In phase one, the Black Knight fights just like a Death Knight. He has several special attacks which add a disease to his target including Plague Strike and Icy Touch. He can then follow up with his own special version of Obliterate. He will also cast Death's Respite on random party members causing significant damage, a two second stun, and a knock-back. Lastly, he will summon a Ghoul to fight with him which he has the ability to blow up using Ghoul Explode for heavy AoE damage. This phase is relatively straight forward. It is important that the Ghoul be quickly burned so as to prevent it from exploding. It is also possible to mitigate a great deal of damage on the tank by cleansing the Black Knight's diseases. Lastly, the healer should keep the parties health topped off to avoid deaths due to the stun or damage caused by Death's Respite. Once you kill the Black Knight the first time, he resurrects and begins phase 2. As a skeleton, the Black Knight will no longer cast Death's Respite, but will now drop a 50% slowing and light damage AoE at the feet of his target. This effect can largely be ignored. He will also continue using Plague Strike and Icy Touch on the tank. What really sets this phase apart from the Flesh Phase is that the Black Knight will cast Army of the Dead as soon as the phase starts. The Ghouls themselves do not do significant damage, but the skeletal Black Knight will continue casting Ghoul Explode which can quickly wipe the raid if the Ghouls are not burned. Obviously this favors a group with heavy AoE damage, but even focused single target burning should down enough Ghouls to prevent to many explosions. Once you kill the Black Knight for the second time, he enters phase 3. The Black Knights Ghost Phase is completely different from the other two and is nothing more than a brief burn phase. Upon becoming a ghost, the Black Knight will start chain casting an ability called Death's Bite which causes a moderate amount of damage to the entire party and adds a stacking debuff which increases magic damage taken. This stacking debuff is the timer for the burn phase as eventually it will cause Death's Bite to do so much damage it wipes the group. The Black Knight will also cast a debuff on a single party member called Marked for Death which will increase magic damage taken by 200% for 10 seconds. The combination of Marked for Death and even a couple stacks of Death's Bite can quickly turn fatal especially for party members with limited health, so the healer will need to be on top of his or her game. The Black Knight should die very quickly in this phase and then you can collect your sweet, sweet loot. Love it or hate it, patch 3.2 goes live today following the end of server maintenance. For those of you looking to download Patch 3.2 using means other than the often broken Blizzard Downloader, check out Wowwiki's Patch Mirror List. I am currently grabbing the patch from here, but I have not had the chance to test it yet. As always, be on the look out for viruses. The download speed anywhere is going to be a little slow from anywhere, but you will still generally be able to download Warcraft patch 3.2 faster and with fewer errors than through Blizzard. Happy hunting! Blizzard has released a slightly less than comprehensive Q & A about the new Crusaders' Coliseum instances to be released in patch 3.2. Feel free to check out the questions and their respective answers here. One of the more interesting pieces of information shared is the magic number for tribute run attempts. According to the development team, heroic raiders will be capped at 50 attempts per reset to reach the post instance loot cache. The less of those "wipes" used, the better the loot. It is an interesting system, especially in light of the new instance reset delay feature as guilds will need to choose between using attempt number 20 to try to push past boss number 3 or allowing the instance to reset and starting at boss 1 with a fresh 50. Unfortunately, the Q & A fails to address one of the most confusing elements of the instance which the developers have alluded to on the forums. Supposedly, different bosses will be introduced to the Coliseum on different weeks. Thus far, the community has been left in the dark as to how this will work and what it means for progress focused raiders. Here's hoping things get cleared up before 3.2 drops later this week.